Car Removal Made Easy and Hassle-Free - Includes Free Towing! If you need prompt and free car removal service, consider donating your vehicle! More than just clearing a spot on the drive-way, you’ll be providing needed donation dollars to the community, country, or global cause that matters most to you. Car Removal – Give a Car – Get Free Service. Our customer service is Guaranteed to make you feel great when you donate your car. A simple car removal by Donate a Car Canada means room in the garage and a gift to charity. Our attentive donor support staff will take care of all the car removal details from towing to re-sale. We’ll then send your gift off to your chosen charity, and you’ll receive a tax receipt. This is car disposal that means no more grease stains in the driveway and donation dollars put to work! My husband passed away a few years ago, and as well as a hole in my heart, this left me with his old 1991 Honda Accord. This car had reached the end of its life, and I had been trying for months to find someone to come and take it away. No luck with anywhere I tried, since I live in the country and no one was willing to drive this far to get it. I did contact two scrap dealers who promised they would be out within 48 hours to pick it up. That was several months ago, and yet here it sat. Make a Difference – Donate Your Car! 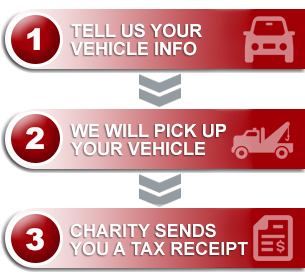 When Donate a Car Canada arranges for your car removal, you can be assured that your donated vehicle is going to impact the cause you care most about. You choose any charity in Canada to receive your gift, and we will ensure their process is simple, too. With no need for them to manage the car disposal, and with no costs to them, they can put your entire gift to work making a difference.